ANNEX PAINT reserves the right to refuse service for any reason. We do not sell paint products to minors and or those who appear to be using paint product unethically. The Consumer assumes all responsibility for following the manufactures recommendations on safety and application procedures. As well as following all state and local code and regulations regarding the use and application of our coating products. If you are unfamiliar with the application instructions of a particular product please contact our sales staff and they will be glad to assist you. ANNEX PAINT will assume no responsibility for application errors. Refunds and Returns: You may return unopened gifts sold and fulfilled by Annex Paint within 7 business days of delivery for a full refund. We'll pay the return shipping costs only if the return is a result of our error (you received an incorrect or defective item, etc. ); otherwise your refund will be less the cost of shipping. You will need to contact us to receive a authorization code. All Annex Paint custom-ordered items and custom colors are made to your specific requirements and therefore cannot be returned. Payment: We accept Mastercard, Visa, American Express and Discover. Your credit card will be charged at the time your order is placed. Prices are subject to change without notice. Cardholder Billing: Your credit card will be billed and the descriptor on your statement will read: ANNEX WAREHOUSE-Phone Number. Corporate Purchasing: A Company Account may be established upon credit application and approval. Your first order must be paid via credit card which will be kept on file. Invoices for which payment is not received within 10 business days from the date of the invoice will be charged to the credit card on file. No exceptions. Custom imprint orders must be paid in full at the time the order is placed. Shipping: Materials shipped from our facility are shipped via Fed Ex and/or UPS. Ground shipping charges are applicable and are determined using gift weight, size, destination and arrival date. A physical address and phone number is required for all shipments: we cannot ship to a P. O. Box. Customers will be charged for deliveries made to a wrong address due to incorrect address information being provided to us. Every effort will be made to ship your order within 24-48 hours, unless it is a large order for which arrangements will be made on an order by order basis. We take care in packaging our poducts for secure shipment. orders will be packaged appropiately for best practice and most efficient shipping. In the rare event that damage does occur during shipping, please contact us within 24 hours of receipt so that we may take appropriate corrective actions. Local Delivery: Local deliveries are made in the LA area.we deliver up tp 60 mile from the store in Reseda, and on special occassion we go further. You will be able to cancel your order after viewing the shipping options if you wish. if there are questions on shipping rates please feel free to call us. We will phone ahead for residential deliveries to ensure that someone will be available to accept your Delivery. We NEVER leave materials on a doorstep unattended! If no one is available, we will leave a message asking them to return our call to schedule a delivery time convenient with their schedule. We also do this so that you will not be charged for multiple delivery attempts if the recipient is not home. Customers will be charged for deliveries made to a wrong address due to incorrect address information being provided to us. Corporate deliveries will be made between 09:00 am - 5:00 pm. Customer Service: Phone -818-344-3000 ask for Greg Or Bill. We are interested in seeing that you get the very best performance form our coating and will assist you in whatever ways we can. 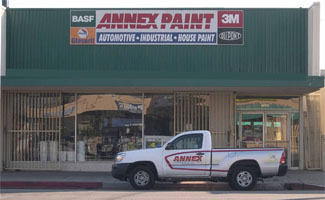 As always, If you have questions or comment please Contact us via Email at: info@annexpaint.com or call us directly at 818-344-3000 and ask for Greg or Bill. All orders placed online after business hours will be processed the next day. Orders placed on Saturday, Sunday or holidays will be processed the following business day. All orders are generally shipped within 24-48 hours unless otherwise specified. Large orders may require some additional lead time. Lead time varies during our busy holiday season. Please place your holiday orders early to ensure on-time delivery. Online - Available 24 hours a day: Our shopping cart is secure and easy to use!